Paleontologists now believe that mighty mosasaurs -- which could grow to 50 feet long -- gave birth to their young in the open ocean, not on or near shore. 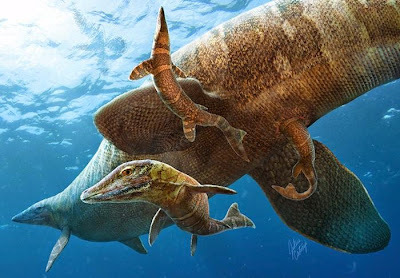 In their study, Field and his colleagues describe the youngest mosasaur specimens ever found that were previously been thought to belong to ancient marine birds. Field and Aaron LeBlanc concluded that the specimens showed a variety of jaw and teeth features that are only found in mosasaurs. Also, the fossils were found in deposits in the open ocean.